Health conscious porridge eaters are missing a trick this winter and should be using oat milk for their winter breakfasts instead of milk or water, according to Vitasoy ambassador and nutritionist Zoe Bingley-Pullin. Health conscious porridge eaters are missing a trick this winter and should be using oat milk for their winter breakfasts instead of milk or water, according to Vitasoy ambassador and nutritionist Zoe Bingley-Pullin. Responding to Vitasoy’s new research into Australian attitudes towards food, the data shows that the majority are increasingly concerned about their heart health with two in five surveyed saying they eat porridge to help reduce cholesterol. However, as little as 1.5 percent know the recommended daily intake of the cholesterol-lowering ingredient beta-glucan, naturally found in oats. Recommended by the Dietitians Association of Australia as a healthy breakfast food, oats, like oat milk, contain a soluble fibre called beta-glucan that can actively help to reduce cholesterol reabsorption. Porridge made with water or milk only provides half the recommended daily intake of beta-glucan, yet simply switching to oat milk would provide the whole 3 grams says Zoe. Plant milks are becoming increasingly popular for their health benefits as well as providing a variety of taste and texture in Australian’s milk repertoire. Oat milk has a creamy texture, the flavour of oats and more fibre than any other milk. It’s hard for people to remember specific nutrition information. If the only thing you do this winter is to make your porridge with oat milk, you can help to boost your heart health significantly, she added. – Native to southern Europe and eastern Asia, oats have been cultivated around the world for two thousand years. – Before they were consumed as food, oats were used for medicinal purposes, which they continue to be today. A common ingredient in skin and bath products, oatmeal can help sooth dry, flaking skin or itchy rashes, including those that occur with contact dermatitis and eczema. – The process oats undergo after being harvested and cleaned, keeps their bran and germ in tact, so they’re packed full of fibre and nutrients including protein, calcium and zinc. – The beta-glucan found in oats which can help reduce cholesterol reabsorption can also help stabilize blood sugar. So having a bowl of porridge in the morning can help make it easier to keep blood sugar levels under control and cravings at bay. – The largest bowl of porridge ever made was produced in Russia in September 2011 and weighed a whopping 865kg. In Greenwich Village, Manhattan, you’ll find the world’s first oatmeal bar, serving up sweet, savoury and desert menus.Ê One of the unusual topping is crumbled Gorgonzola, with dried figs and balsamic vinegar glaze! About Beta-Glucan: Beta-glucan is a type of soluble dietary fibre found in cereal grains like oats and barley. 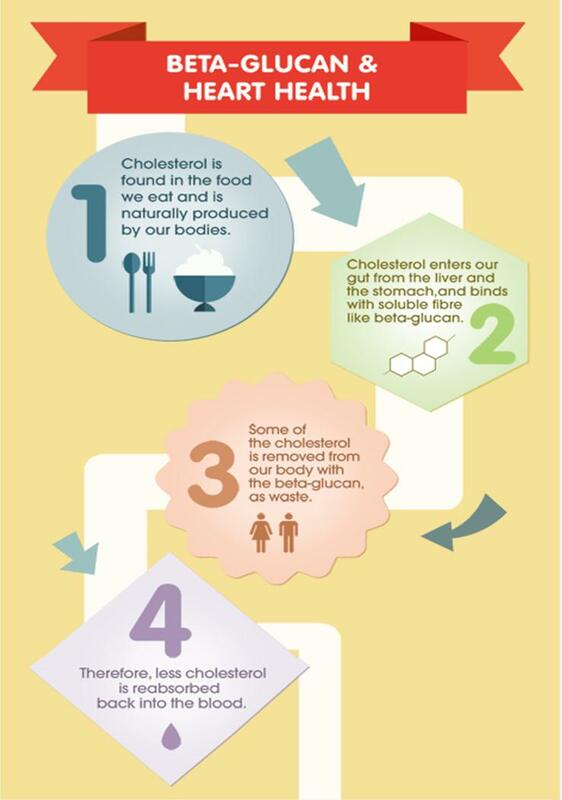 Research shows that 3 grams of beta-glucan per day can help in lowering cholesterol absorption. There are so many yummy and healthy foods out there, don't think of a healthier diet as difficult, think of it as a smorgasbord. Achieving or maintaining a healthy weight shouldn't rely on a diet. This is about changing your lifestyle so it becomes second nature. And that takes time. But it can be done. Instead of going all out, introduce one new change to your life each week or each month.